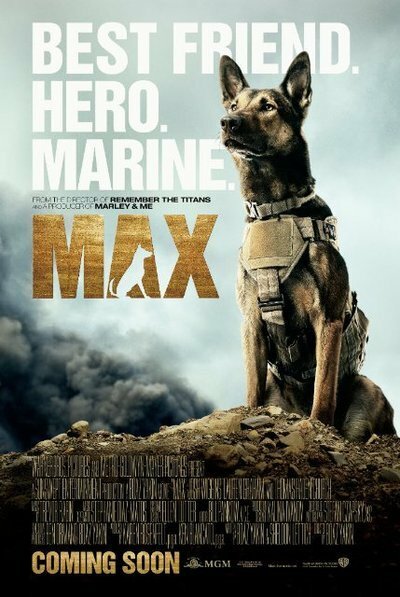 “Max” is a case of the tail wagging the movie. Thank goodness it does, however, since the tale itself leaves a bit to be desired. Doggy derring-do has been a hallowed Hollywood tradition ever since the silent days when superstar canine Rin Tin Tin was disqualified from winning the first best-actor Oscar because of his non-human status even though he had earned the most votes. But even time-tested genres like animal yarns need to learn new tricks. That is probably why this story about a trained military pooch that must learn to cope with civilian life after his handler is fatally wounded in Afghanistan is a mutt of sorts. It’s part faith-based family film, part teen coming-of-age melodrama with a hint of “American Sniper”-“The Hurt Locker” war-zone action tossed in. That is all well and good. But matters go astray midway through when too much time is spent on a far-fetched subplot about a gang of Mexican arms dealers that obtains its contraband weapons from a corrupt American soldier. Lassie and her child companions often got into some dicey scrapes, but as much as I can recall, they usually didn’t result in much of a body count. But before such illegal activity becomes the focus, we are quickly introduced to Marine Kyle Wincott (Robbie Amell) and the mighty Max himself, a sleekly handsome Belgian Malinois and the current breed of choice for sniffing out danger on the frontlines. When Kyle engages in a Skype session with the folks back home in small-town Texas, there is palpable tension in the air. That’s because proud mom Pamela (Lauren Graham in God-fearing matron mode) and dad Ray (a more-dour-than-usual Thomas Haden Church as a Desert Storm vet left hobbled from a grievous injury) attempt to engage in upbeat pleasantries while trying to ignore the surly video-game-playing adolescent elephant in the room. That would be Kyle’s brother, Justin (Josh Wiggins), who resents the bond between his father and his heroic sibling and acts out by secretly selling pirated copies of video games to his acquaintances. Their world soon is turned upside-down and the movie pounces upon its first opportunity to draw tears after Kyle is killed under uncertain circumstances during a mission. A distraught Max, discharged from his duties and returned to the States, strains angrily at the leash held by Marines as they pay their respects to their comrade during a church funeral service. But when the grieving dog spies the flag-covered casket, he silently drapes his front paws over it and bows his head. How can you not adore Max? Ask Kyle’s father, since he would rather not deal with this living reminder of his elder son’s demise. But when Justin turns out to be the one human who can control Max, suffering from the effects of post-traumatic stress disorder, the family reluctantly takes him in. And, for a while, the film becomes a not-bad story about avid bike rider Justin mending his ways thanks to the love of a good pooch and of a sassy tomboyish cousin of his Mexican pal, Chuy (Dejon LaQuake). Carmen (Mia Xilali) has experience in handling dogs—Chuy, the film’s designated wisecracker, compares her to TV’s Caesar Milan, adding that she’s ”got a mustache and everything.” But she thankfully also knows her way around awkward teen boys. But when Tyler (Luke Kleintank), a soldier friend of Kyle’s who was present when he died, returns to their hometown and tells Justin’s dad that Max was to blame for his son’s fatal accident, the emotional logic of the film begins to unravel. Why would Ray trust this guy, who is giving off all sorts of shady vibes, and not rely on Max’s instincts since he snarls every time he sees Tyler—especially given how the pooch is helping his younger son to come out of his angry shell? He even gives the guy a job working at his storage-unit facility, the perfect place to store the weapons that Tyler intends to sell. Given the vast extent of Ray’s gullibility, it naturally is left to the kids and Max to eventually come to the rescue. Director and co-writer Boaz Yakin (“Remember the Titans”) at least provides Haden Church a moment to shine when Ray and Justin engage in a painfully honest heart-to-heart talk. The filmmaker also occasionally remembers he is making cinematic experience and not a TV movie by providing some arty atmospheric touches—the reflection of Fourth of July fireworks in the windows of parked cars, a whirring fan signaling something is amiss, a full moon partially obscured by clouds. Most importantly, Yakin treats Max (played primarily by a dog named Carlos along with various stunt doubles) with dignity and doesn’t go overboard with anthropomorphizing his behavior or that of the Chihuahuas and Rottweillers also in the cast. But instead of building upon the welcome openness of that potentially healing father-son encounter, “Max” stumbles through some iffy crime-thriller territory and ends up pushing its PG rating to its limit. But none of the non-fur-bearing actors really stand a chance of upstaging the noble Max, which is probably just as it should be.